The businesses below provide additional prizes for the 50/50 drawing. Listen to the motor purr in idle speed. Smell the fuel. Spook up some ducks from the pads on the right. See some minnows skitter on the surface to the left. Hear the boil of a bass nearby. Feel the butterflies from the anticipation of a topwater strike. Then look up and see the sun poking up over the trees for the first time and you remember why you fish. 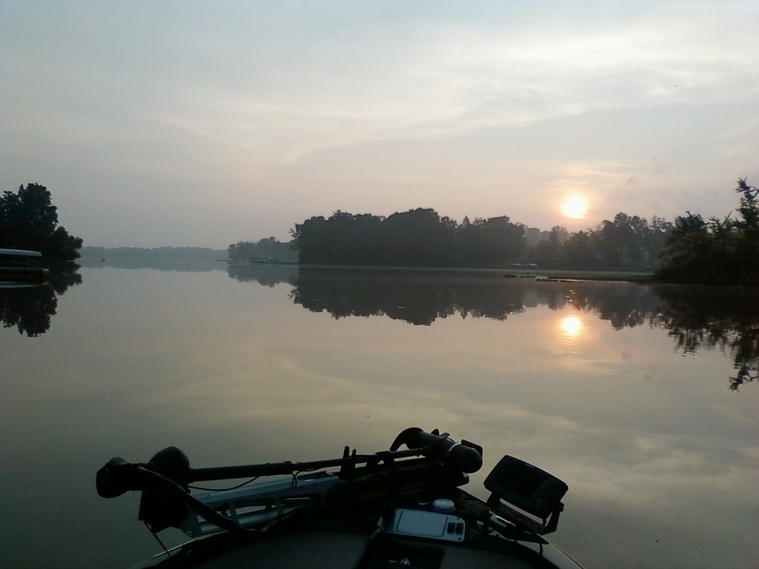 Despite its reputation as a premiere bass lake, Paw Paw Lake provided the worst weigh in of the year for the R & B Bass Circuit. There were only 2 fish over 3# weighed and just 2 limits. A rarity for this body of water. Not only was the bite tough, but the perpetual rain during registration and the first few hours of the tournament proved most challenging. While most expect the bite to improve during the rain, there were no reports of that. But like every event, several competitors found a way to catch some quality fish. 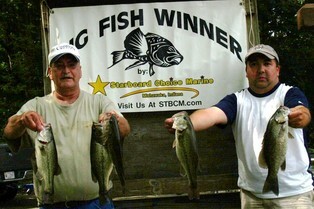 1st Place: Derek Deardorf and John DuPont caught a limit and culled several fish with a 1,2 combination off the docks. DuPont tossed a Komodo Dragon stix while Deardorf tossed a Lock Jaw jig. However, the bigger fish were caught with the jig. The team's limit weighed 11.38#. This won them $390. The key was finding good weeds next to the docks. The team felt the fish seeked out shelter during the rain and the docks provided this protection. 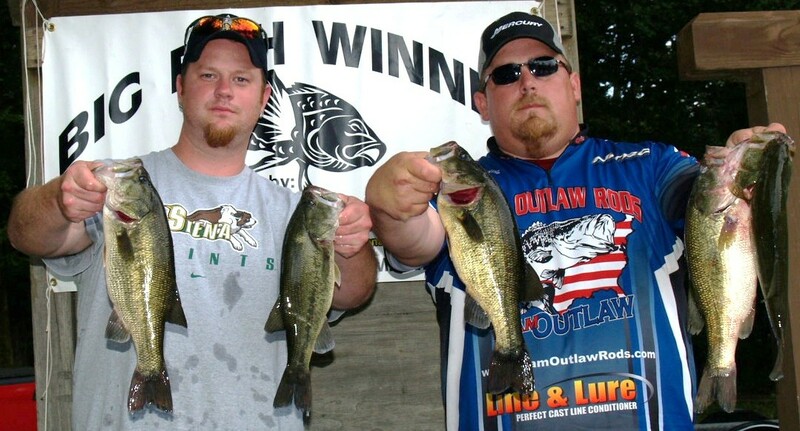 2nd Place: The team of Sean Cleland and Larry Thomas are on a mission to qualify for the Classic. And despite missing 2 events, they are now poised to qualify. They caught the only other limit on Paw Paw. 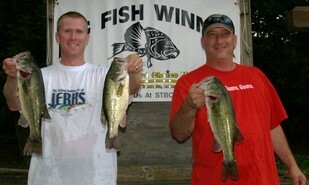 Their catch weighed 9.09# and earned them $275. More importantly though, it moved them into 8th place in the Standings. They caught their fish on Yamamoto Senkos and Yamamoto twin-tailed grubs. They found fish on both the docks and on the breakline. 3rd Place: Tournament directors Andy Buss and Kevin Rybicki weighed just 3 fish for a total of 8.05#. This was only the second time this year that a team won money without a limit. It earned them $200. The team targeted docks the entire tournament. They tossed Komodo Dragon stix and soaked them. It was typical to rest the bait for 10 seconds before the fish bit. Although a dock bite typically seems to be reactionary, they were not on this day. Hence, the scent of Komodo Dragon baits may have been a factor. 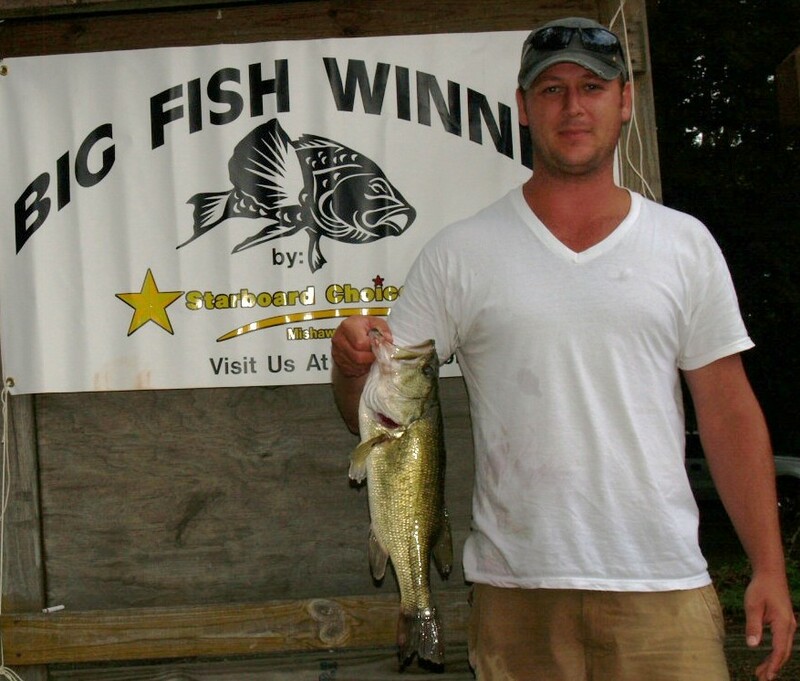 4th Place: Ron Fabiszak fished solo as his partner, Mark Fennell, had a commitment elsewhere. 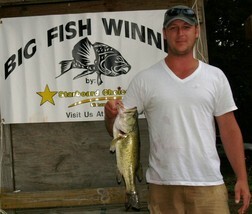 But this did not stop him from winning the D's Lures Award with 4 fish weighing 7.93#. He caught 1 fish early on a jerkbait and then threw jigs to the docks. Unfortunately, Fabiszak drew boat #13. And while Ron is not a superstitious guy, the curse seemed to find him. His first fish, which came on a jerkbait, died in his livewell and cost him $200. 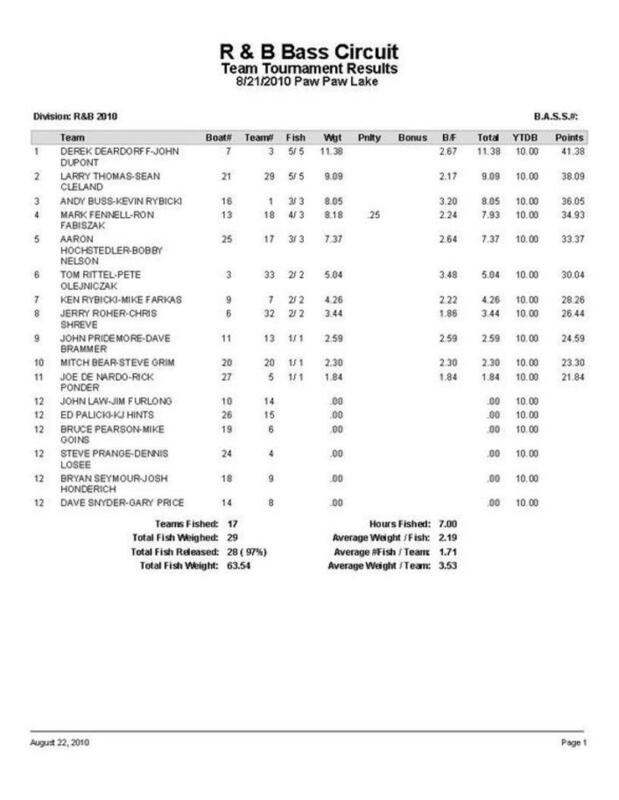 The .25-pound penalty for dead fish lowered his weight to .12# behind the 3rd place team. This is the first fish at any R & B tournament not to be released alive. While bites were few, the bites were quality. Unfortunately, the team lost 2 additional keepers that would have made things more interesting. Starboard Choice Marine Big Bass Award: Newcomers Tom Rittell and Rob Olejniczak (pictured right) fooled a 3.48# largemouth with a tequila sunrise 10" Berkley Powerbait ribbon worm. The team was awarded $170. Click on image below for larger version. Your Sponsors support you. Please support them!